Fireworks are beautiful, but not when they are erupting from your favorite smartphone or laptop! Incorrectly dealing with the voltage in Asia can produce quite a show. More than a few unfortunate travelers have found out the hard way that the voltage in Asia differs from what is used in the United States and Canada. Fortunately, most manufacturers today are savvy enough to create dual-voltage devices that are ready for international use. It's a lifesaver—literally. But to be safe, you should still confirm that your device's charger will work with the voltage in Asia; it's double what Americans are accustomed to using. Although devices designed for 120 volts may work properly, they often put out a lot more heat when operated at the higher voltage. Even if your device is ready for travel, the power in remote places isn't always "clean." Voltage sags and surges on the line can damage delicate components and cause latent failures. Improper grounding is often an issue. Taking a few simple measures could prolong the life of your expensive iToys. A majority of countries in the world use a 220/240-volt electrical infrastructure, twice the voltage coming from outlets in the United States. With the exceptions of Japan and Taiwan, pretty well every country in Asia uses a 230-240V system. Electronic devices not designed for this higher voltage level most certainly will not survive even a tentative plugin. Using single-voltage devices in countries with a higher voltage requires a travel voltage converter. Unlike passive "travel adapters," a voltage converter (transformer) is a relatively heavy device that "steps down" the voltage. They are active devices that manipulate the voltage. Travel adapters merely change the prong configuration so that your plug will fit into unfamiliar outlets. Caution: Many hotels are wisely installing universal sockets so that guests from all countries can connect to the power. But just because your plug fits into the outlet, you cannot assume the voltage is safe for your device! The good news is that pretty well all USB-charged devices (smartphones, MP3 players, tablets, smartwatches, fitness trackers, etc) will charge fine anywhere in the world. Chargers and transformers (the bulky box found at the end of your cord that likes to eat up power-strip space) should have the operating range stamped on the outside. Sometimes the print is tiny or difficult to decipher. A device marked with the above or similar will work just fine pretty well throughout the world. Of the information available printed on the charger, you are most worried about the higher end of the voltage rating (denoted by V), not the amperage (A) or frequency (Hz). If you do not see 240V (220V may suffice) indicated somewhere on the device, do not try to use it in Asia without a travel power converter. If in doubt and you really need to pack that hair dryer, try checking the manufacturer's website to look up your device's official technical specs. Laptops, USB chargers, and smartphones will work with the voltage in Asia, however, they tend to become warm. Keep this in mind when charging devices; try to keep them where they can vent and cool rather than on the bed. The additional heat may shorten the life cycle of the charger. Although many electronic devices today can handle a wide range of voltage, the real frustration is the lack of a standard for power outlets throughout Asia. Many countries simply did their own thing; others adopted the differing standards of their European colonizers. For instance, Malaysia favors the square "Type G" plugs from the United Kingdom while neighboring Thailand has a mix of US-style and European plugs. 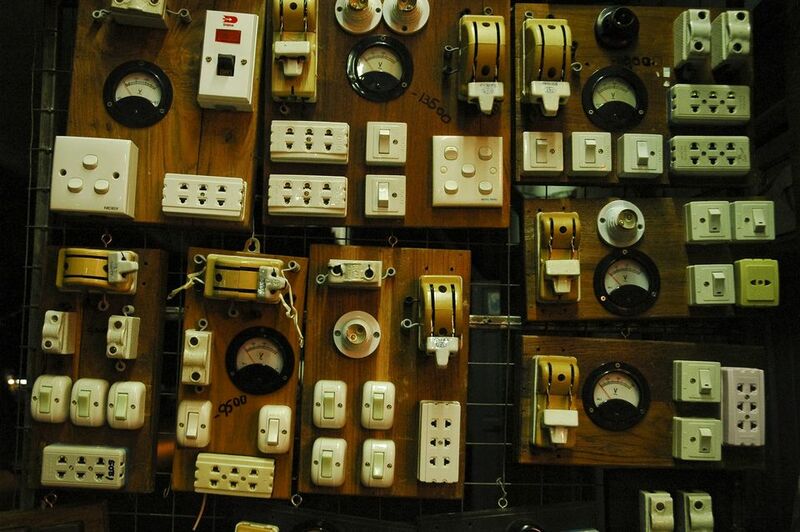 Countries throughout Asia rely on different standards for plug types and outlet configurations. To be safe, you'll need a travel power adapter. Power adapters are passive devices and do not change the voltage higher or lower. Fortunately, travel power adapters are lightweight and inexpensive. They should be a part of every international traveler's kit. Models and styles range widely, but adapters with a smaller footprint may better fit into power strips or dual sockets without blocking other outlets. The best adapters have built-in USB ports for charging smartphones and such. Forgo the adapter kits with individual ends that can get lost on the road. A better option is to pick up a couple universal everything-to-everything adapters. These lightweight adapters are often spring loaded or have switches to allow you to choose which style prongs to lock into place. They enable you to connect any device to any socket in the world. If you opt for a fancy adapter with surge protection or advanced features, check the operating voltage range! Tip: Some hotel receptions will provide power adapters for free if you accidentally left yours somewhere. Not to be confused with power adapters which only change the physical plug, voltage converters are active components and actually step the voltage down from 220-240 volts to a safe 110-120 volts. If you absolutely have to use a device in Asia not rated for 220 volts, you will need a voltage converter. When purchasing a step-down transformer, check the output wattage (e.g., 50W). Many produce just enough output for chargers and small devices but may not be powerful enough to supply hair dryers or wattage-hungry devices. Voltage converters are heavier and more expensive than simple travel power adapters. Avoid them if possible by choosing devices better suited for travel. Travelers are often better off by simply purchasing a newer, dual-voltage version of whatever devices they wish to take traveling. Some developing countries and islands in Asia don't always have "clean" or reliable power. Wiring may be best effort and uncertified. Grounding is often poor or incorrect. Many islands and some remote tourist operations depend on generators. When started or failed over, generators produce spikes on the infrastructure. Power surges and sags take a toll on delicate devices. If you are not sure how clean the power is in a remote area, avoid connecting your devices and leaving them unattended. Wait to charge things until you'll be there in the room. When you see the lights change in intensity or hear the fan increase in speed, pull the plug! Another workaround is to charge a portable power pack then use that to transfer a charge to your smartphone. The power pack acts as a "middleman" and is a lot cheaper to risk than the average smartphone. Oddly, Japan is an exception in Asia—and the world—by utilizing a 100-volt system. Devices designed for 110-120V will usually operate fine but may take longer to heat up or charge. The plug type in Japan is the same as those used in the United States (two-prong Type A / NEMA 1-15). What Types of Finnish Electrical Adapters Will You Need?